Do economic sanctions work? Past experience provides little hard evidence to go on. Professor Adam Roberts is a research fellow at Oxford University - one of the great British figures in the study of international relations. "There are very few cases where you can definitely identify sanctions as having had a success, except sometimes in combination with other factors," he says. 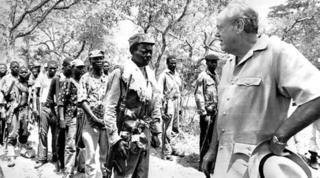 "Arguably they contributed something to the change in white minority Rhodesia that led to black majority rule; arguably the sanctions against South Africa were one factor that contributed to change there." "So", he concludes, "it is impossible to say in either of these cases that sanctions were the decisive factor." In July 2010 President Barack Obama signed into law a series of tougher bilateral sanctions against Iran. These were intended to turn the screw on Tehran and to bolster existing United Nations Security Council sanctions. The hope was that the mix of UN and bilateral sanctions - tougher measures are already being planned by the European Union - would persuade Iran to change its mind and halt its uranium enrichment programme. So far they don't seem to be working. Nonetheless, since the end of the Cold War sanctions have been used much more frequently as a tool of international diplomacy. Veteran diplomat Sir Jeremy Greenstock, Britain's ambassador to the UN between 1998 and 2003, says the fundamental reason for the popularity of sanctions is "that there is nothing else between words and military action if you want to bring pressure upon a government". "Military action is increasingly unpopular and in many ways ineffective in a modern legitimacy-oriented world, and words don't work with hard regimes. So something in between these is necessary. What else is there?" he asks. Sanctions are all very well, but if they are to work they must be universally applied. And as Nicholas Burns, the most senior professional US diplomat in the Bush Administration says, as far as Iran is concerned this is just not happening. "Many countries are effectively ignoring them or, like China, undercutting them," he says. Indeed he argues that China has become the largest trading partner with Iran since these UN sanctions have come into effect. "They are a very difficult and sensitive policy instrument", he concludes and, echoing Adam Roberts' view, he says "there are very few examples looking back over the last 25 to 30 years where sanctions have actually succeeded". In many ways sanctions also have a poor track record in terms of their impact upon a country's economy. They have tended to hit home against the ordinary people - the ruled - rather than against the rulers who are often the real target for pressure. The experience in Iraq during the 1990s is a case in point. The air attacks in the US-led war to liberate Kuwait hit Iraq's infrastructure hard. They exacerbated an already difficult situation caused by the imposition of sanctions. Professor Joy Gordon, of the Global Justice Programme at Yale University, has just written a new study on the impact of these sanctions. The combination of the bombing strikes and the sanctions were devastating, she says. "Iraq had the wealth to rebuild," she says, "but the devastation of the infrastructure and then the almost total cut-off of exports and imports, meant that Iraq was - in the words of a UN envoy - reduced to a pre-industrial state and then was kept, more or less, close to that condition for over a decade after." The debates on how many perished, especially children, continue to this day. She argues in her book that the best estimate of excess child mortality - the number of children under five who died during the sanctions who would not have perished had pre-war and pre-sanctions conditions continued - is between 670,000 and 880,000. Adam Roberts says that the figure may be significantly lower. But there was hardship and suffering and he has no doubt about the lesson of the Iraq experience. "Very often it is the case that the first people to suffer from sanctions are the population generally and the powerful people - the people in the regime - can find ways of getting around sanctions," he adds. The disproportionate damage to Iraq's civilian population encouraged policy-makers to think again about sanctions and how they are applied. Sir Jeremy Greenstock says that the whole Iraq episode underscored the fact that economic sanctions are not a tool that works quickly. "They take a long time. Therefore we want to try to devise an instrument that gets through to the decision-makers at a sharper pace than just the collapse of the total economy, from which too many people suffer." Thus were born "smart" or "targeted" sanctions, aimed against the rulers rather than the ruled. But is there enough clarity as to what these smart sanctions against Iran are really for? Were they seeking to change the Iranian government's behaviour on the nuclear issue? Were they about isolating Iran? Or was the idea, perhaps, to change the regime in Tehran altogether? In response Sir Jeremy Greenstock says: "Well perhaps all of those things", before going on to acknowledge that sanctions are still a blunt instrument. "The bluntness is excused to some extent because there is no other instrument but we have to recognise that there are all sorts of unintended consequences and we have to try to mend those as we go along, if we insist upon using sanctions in the first place." Sanctions can also have another down side. They can provoke a defensive reaction on the part of the target country and its population. Adam Roberts says some have called this the "Battle of Britain" effect; a reference to the days in 1940 when Britain stood alone against everything the German Luftwaffe could throw at it. "The problem is how to prevent these sanctions from leading to very strong nationalist resentment in Iran itself. When Iran was attacked by Iraq in 1980, the international community did not come to its aid. It did not sanction the attacker, Iraq - and that's remembered in Iran." "In the Iranian regime's official pronouncements there is a sense that only we can look after ourselves," he says. "And in these circumstances it's a very difficult task to gauge the sanctions correctly so that they don't exacerbate the problem that they are designed to address." All in all then, sanctions appear a problematic tool at best. Maybe they work, to an extent, but only in concert with other measures. Carrots may be equally as important as sticks. It's by no means clear that smart sanctions are necessarily any smarter. Indeed they may take even longer to work and over time they may still involve considerable damage to a country's wider economy. Nonetheless in a limited diplomatic armoury, between words and warfare, there may indeed be little else.